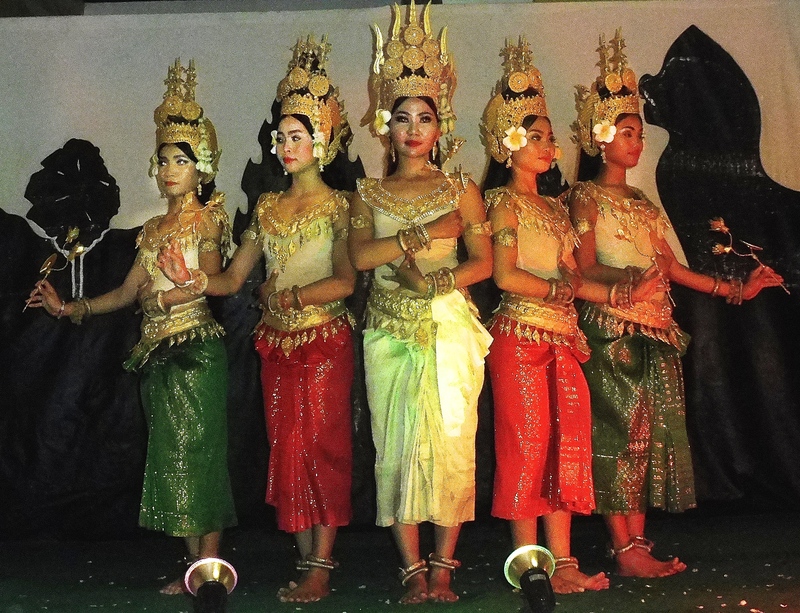 These young women were part of a group of Cambodian folk dancers who performed during our time in Siem Reap. The gentle movement of these dancers and their male counterparts was mesmerizing and clearly express the inner strength and peacefulness of the people. Photos in these albums were selected from those taken mainly by Esther and Harold. In a few cases, representative photos selected from the Web. 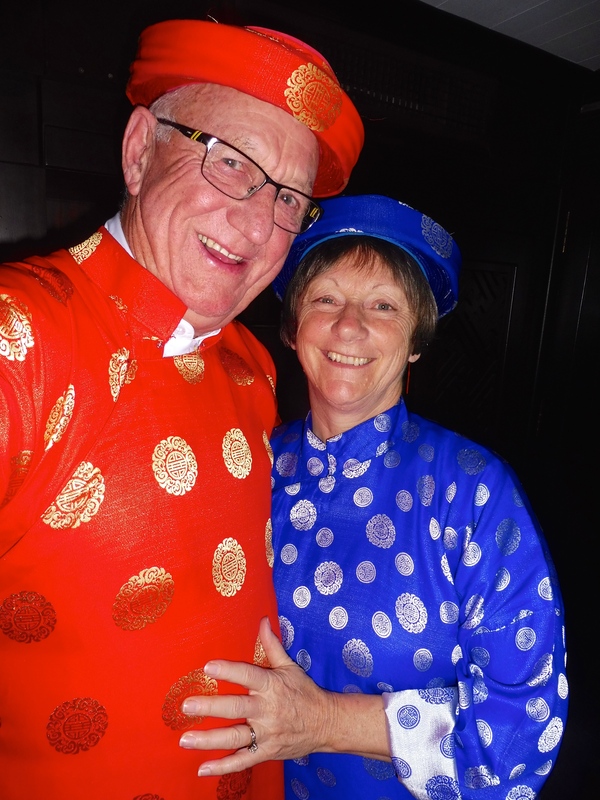 Part V Cruising the Mekong with Uniworld (being written) December 4. This part was split off to Part V. Part IV is being readjusted. Late Sunday afternoon, we decided on a quiet walk through the downtown core. It was a warm, humid, evening, ideal for snapping a few after dark photos of the treasures that surround Hoàn Kiếm Lake and other nearby sites. On stepping from our taxi four blocks from the lake, crowds that numbered in the tens of thousands greeted us. We later guessed the number to be over 200,000. The men, women and children gathered, set the tone for our emerging love of the people and their culture. While we could not speak a word of their language, most young people knew bits of English, and they made us feel welcome and safe at every point. In western culture, we often perceive the world as being filled with violent conflict and are taught from an early age to be suspicious of strangers, particularly those who are different from ourselves. On this night, in the heart of Hanoi, it seems people have found a way to come together in the common purpose of love, peace, and prosperity and not once in our travels did we see open conflict, a beggar (other than children that congregated around some tourists sites) nor a ‘down and out’ person huddled on the sidewalk or in a back alley. While an area of several square blocks was blocked to traffic, we never noticed a uniformed policeman. Perhaps they were in plainclothes, but it never seemed any would be needed as block after block, in the heart of the city people were celebrating. Why were they celebration? It was Sunday and many had a day off. It appeared this weekly routine drew people from their homes in order to share time playing games and music, strolling and greeting other families and friends. Young people (teens and adults, photo right) with mandolins, guitars and various other instruments, gathered in oblong circles of 20 or 30 to play a variety of popular folk songs. Laughing and singing they were eager to have us share in the fun as little children played games with their parents and other children. Older teens and adults competed in 20-person tug of wars, sandal races and many other games not so much to determine a winner, but more in friendly competition. 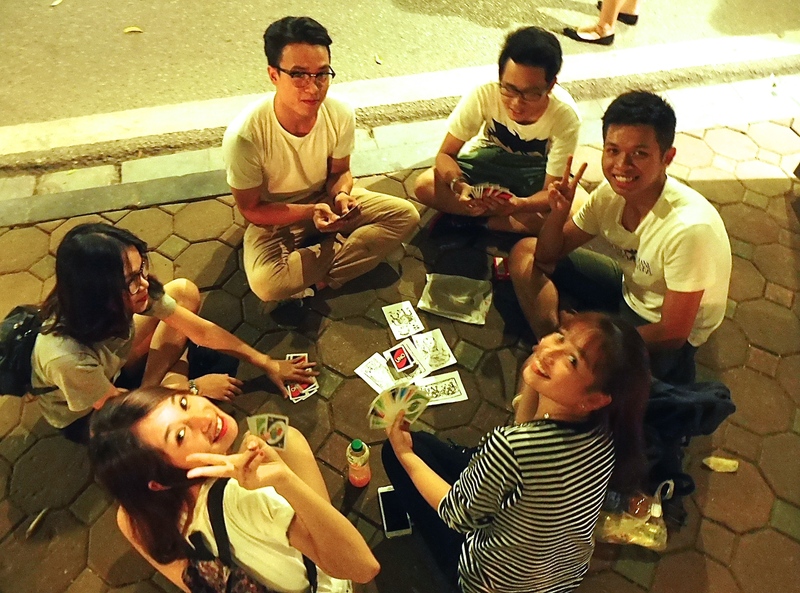 Card games and board games with two to ten people, were taking place on the sidewalk and park benches as in this photo. Other young couples cuddled on park benches as food venders pumped out their specialties. Other venders offered inexpensive (but intricately made) items for tourists and visitors and not once did we see a policeman. Neither did we see any person young or old drinking alcohol or involved in any form of confrontation. In other area’s people gathered around professional musicians who played for free, but accepted donations of appreciation. The only time I have ever witnessed this number of people involved in peaceful street interaction in Canada was during the 1996 Commonwealth games in Victoria and again during the 2010 Olympics in Vancouver. However, even in those instances there was a heavy police presence and homeless and street people were often given the bums rush if they dared show their face or began begging. Perhaps police were present, just not in uniform. As we have only been travelling in Viet Nam a few days, I will need more time to reflect on why this general peacefulness seems to permeate the country. The fact this is a developing country that has so recently been through a horrendous war and suffered so many atrocities, makes the question even more intriguing. When we look back at how Canadians behaved during our past few elections and what is now happening in the US and other European countries facing elections, it makes me wonder if we can ever achieve the peace and tranquility that seems so pervasive in Viet Nam and Cambodia Come to think of it, perhaps driver and pedestrian behaviour in extremely heavy traffic flow provides a clue. 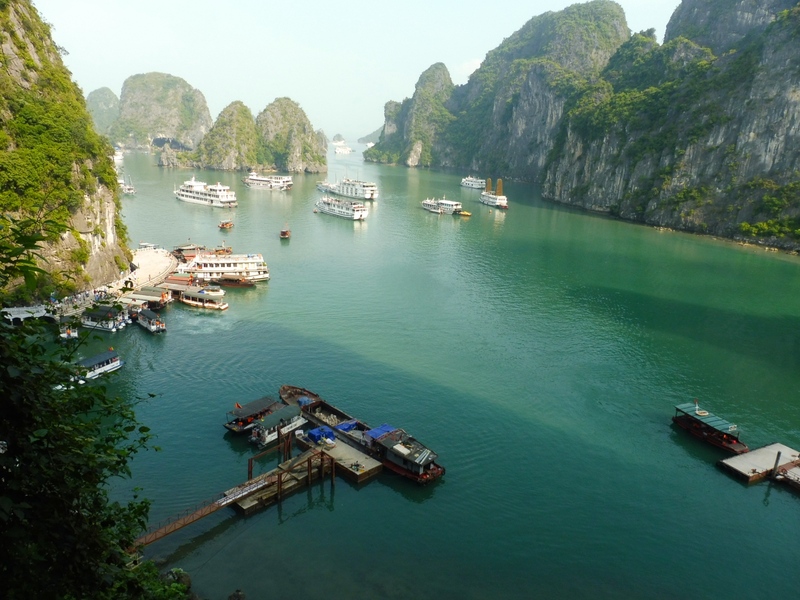 But first, a short description of our pre-tour excursion to Ha Long Bay. As mentioned in an earlier, we had set aside two days for a visit the World Heritage Site at Ha Long Bay and it soon became evident why this area has become such a popular destination. Only three hours from Hanoi and a short drive from the boarder with China, the city near Ha Long is being rebuilt as a tourist destination rather than an overnight stop. Even at this early stage or redevelopment, restrictions are being placed on the number of tour boats and ships allowed to operate within the area. Following a three-hour drive east from Hanoi and after passing by Ha Phong Harbour, the world suddenly opens up to a 1553 Km2 over which is spread nearly 2000 Islands formed from limestone karsts. Many of the karsts are filled with expansive caves and most would be nearly impossible to climb without a great deal of experience and the proper equipment. We toured one of the largest caves in which many Vietnamese soldiers holed up during WWII, from which they harassed the Japanese invaders and at other times the French and an the American allies in wartime. In each instance the invaders found it impossible to dislodge the Vietnamese defeners. Photo: Harold and Lynn getting ready for dinner aboard our ship. The Captain and ten crew of our small (junk type) vessel provided excellent service to our group of about twenty including another couple from Victoria who live only a few blocks from our home in Saanich. The young woman and her boyfriend were on a purchasing tour for her outlet store in the Up Town Mall. Our two days on aboard the vessel was filled with all manner of visits to various islands aboard our ship and the small skiffs that transported us to floating villages and caves. First, let’s deal with the money. Perhaps one of the reasons Garth and I became so popular (aside from our Blues Brothers routine and rugged good looks) was the fact we became overnight millionaires in Hanoi. As $100 USD is equal to $2,247,500 VND (dollars), after we each exchanged $400 USD we became instant multi-millionaires. Wow! It really adds up fast and with the price of goods and services being low by Canadian standards, that pile of money lasted fairly well. 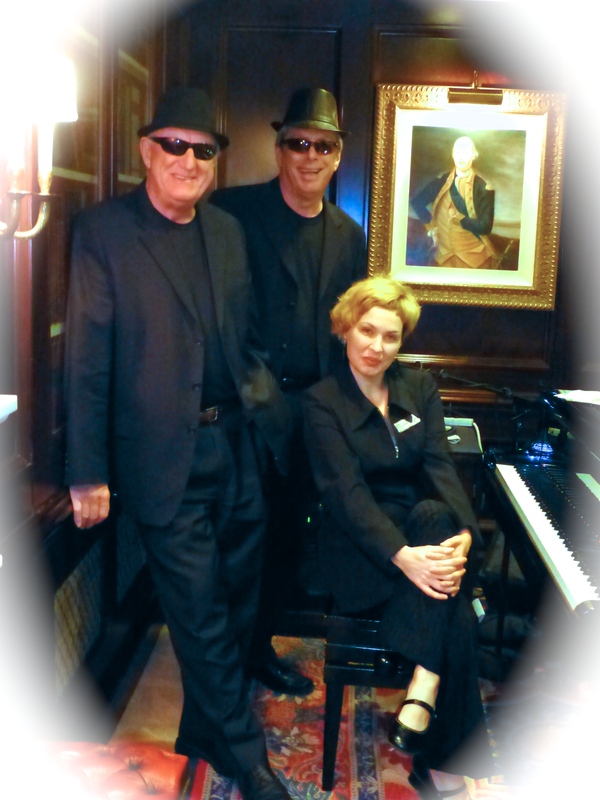 Photo: Garth and Harold with a Russian Jazz Pianist on our tour of the Middle East. A bottle beer runs about $0.75, and a 20-minute taxi ride to downtown Hanoi, $2.00. A five-course dinner for four with two glasses of wine each, about $35. A tip of $3.00 puts you in the big spender category, although service is always excellent whether you tipped or not. At one meal for four, Lynn was missing a couple of utensils for the next course and as an apology, the head server brought an amazing dessert for four. A reasonably well-employed worker in Hanoi might make $450 per month and with several family members working full time, over ten years might possibly buy a small patch of land to build a family home. a newish motorcycle or, perhaps, a car. No income tax is paid until individual income exceeds $450 per month and above that the tax is progressive. A high-end European car rolls in at about $500,000, but a new 100 cc motorcycle could be found for less than $200. Now you understand why there are 45 million motorcycles in Viet Nam, a country of 90 million. Later, when travelling in Cambodia (Kampuchea) the Reil (KHR dollar) held a better rate at $100 USD = $405,000 KHR. At some point, the government and banks must have decided it was too confusing to keep changing money so simply adopted the US dollar as regular currency. Go to a cash machine and you get USD, go to a restaurant and the menus list USD. Of course, the locals still use the KHR, but for tourists, why bother doing the calculation. A Cambodian factory worker earns about $1.00 US per hour and works an 8 day, 6 days a week (7 if they wish). At about $200 a month, the income seems about on par with Viet Nam given the differential exchange rate. That $1.00 per hour wage is about the same as I earned when working at manual construction jobs as a teenager in Alberta back in the 1950’s. 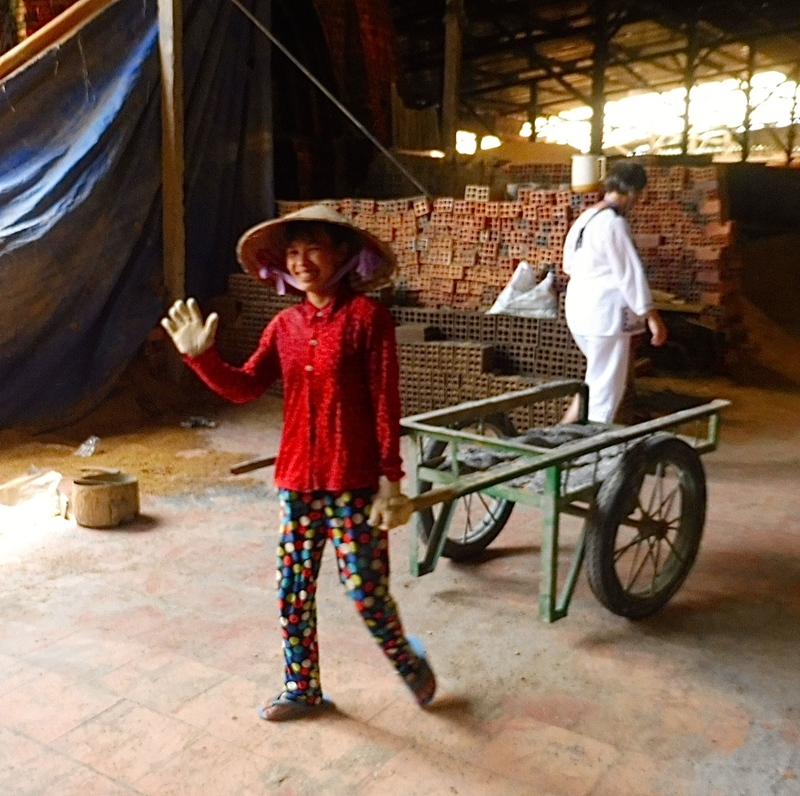 Working conditions seem about the same in the clay building blocks factory we visited and child labour (under 16, I think) is against the law, so one could surmise the standard of living for ordinary workers in Alberta in the 1950’s, was not much lower than in Cambodia and Viet Nam today. Not bad for a developing country just recovering from fifty years of war and one of the worst genocides in the last half of the 20th century. 4. And a few words about traffic. It will take a first time visitor a few days to become comfortable with the traffic flow as you may think death could come within the first few blocks. But, stop, take a few minutes to observe the locals and try to feel the rhythm of the city and when crossing streets, keep moving and don’t stop to second-guess your next move. Drivers and pedestrians are very polite. Photo (hdmc) You might wish to practice walking through light two-way traffic as shown here before you hit the big time. Tens of thousands of vehicles (mostly motorcycles) and pedestrians thread their way through the city in what I could only describe as free flow. Perhaps it is a living example of Heisenberg’s Uncertainty Principle (simplified, there are limits to which complementary particles can be mesaured in terms of position and momentum ). That things change second by second, pretty much sums up the traffic flow. There appear to be few traffic rules and virtually no visible enforcement. The ebb and flow is so smooth it is not unlike a giant pulsating amoeba flowing through the heart of the city. Every available space on sidewalks and roadway is used and while horn honking is prevalent, there is no sense of urgency or that it is being done with malice. A gentle honk is used to alert others you intend to fill an empty (or partially empty) space. Moms, dad’s and kids crowd on motorcycles and bicycles, cell phones in hand and in regular use by passengers and drivers alike. Signal lights are not required and rear view mirrors would be useless as the outlandish loads often completely obstruct the drivers view other than directly in front. In western society, traffic flow represents the exact opposite in that individual drivers aggressively (more often men than women) assert their right to move ahead of the vehicles leading the way. If you can’t move faster than the guy behind you, then get out of the way until you learn how to drive. Put two men side by side at a stop light and you will see a casual sideways glance as each assesses their chance of being first off the line. It’s a game of chicken involving thousands of high-powered cars fitted with the latest safety devices and, for males, whose testostorone begins to peak the moment they slip behind the wheel. Seeking to temper this behaviour governments have created thousands of mind numbing rules that grow daily and enforced by hundreds of traffic gods to whom all must bow in subservience. Gridlock is often the result in many cities and these traffic flow challenges can never be fixed in North America because the need to compete and to be first, is deeply ingrained in our psychic. If you want to observe aggressive drivers on steroids just travel to any city or town in an resource rich province or state where every man, woman and child owns giant V8 pick-up truck. The road becomes a battleground of the toughest and fastest. Welcome to North America. It is not possible in a few paragraphs to capture the ebb and flow of religious belief and life in the region, but while Viet Nam and Cambodia bear some resemblance, Cambodia seems to have a stronger history of attachment to Buddhism and Hinduism mixed with a tinge of Confucianism and Christianity. The country is filled with symbols and structures related to those belief systems with the most famous being the Angkor temples that surround Siem Reap. Monasteries dot the countryside and our guide (a man with long experience in Cambodia) was at one time a practicing Monk. The most famous of Angkor Temples, Ta Prohm, (photo below, hdmc) featured prominently in the movie Lara Croft: Tomb Raider. 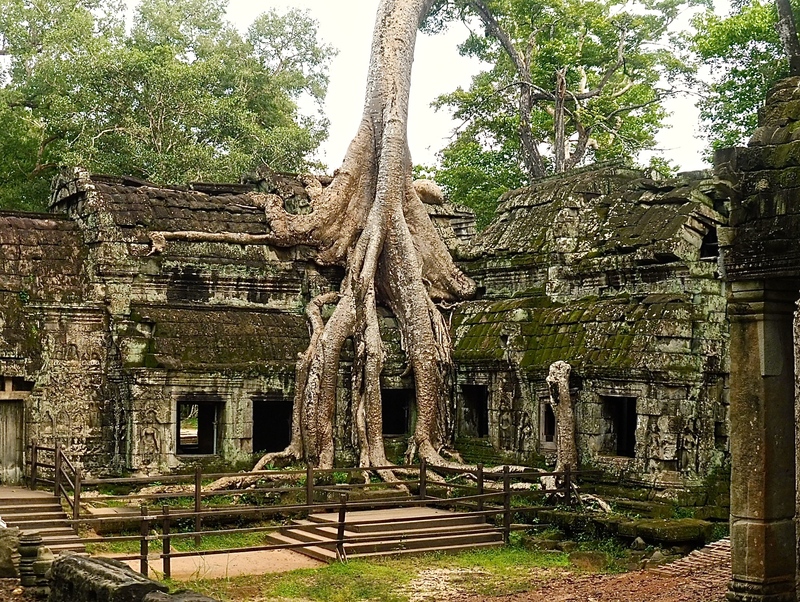 (photo below) Ta Prohm is the only site that was left more or less as it was when re-discovered buried in the jungle in early in the 20th century. I have no deep understanding of the Eastern philosophies, but in my superficial western way it seems the general spiritualism which permeates the region has played a significant role in helping people come to terms with the horrendous events visited their lives over the past fifty years (war and genocide). Because spirituality tends to look inward towards ones self, family, ancestors and spirits, it tends to promote a peaceful, respectful calmness that penetrates to the core of individuals and families, with families and ancestors being held near the centre. The fact the region has ebbed and flowed between several similar belief systems (Buddhism, Confucianism, Hinduism, Animism, etc.) over the past several hundred years, suggests there is not a built up of animosity between them. Very little of this seems to hold true within the theist systems (Muslims, Jews and Christians) as they have been locked in battle for the hearts and minds of the people for over 2000 years. Even groups within the same stream are broken into thousands of subsets each of which claims only they know the path to salvation. Each day news outlets, those standing for government office, government agencies and individuals proclaim their fear and hatred of other religions. Check the posts on your own FB page or go to any of a hundred different mainstream blogs and almost every political party, once in election mode, each begins to stoke those flames of fear. 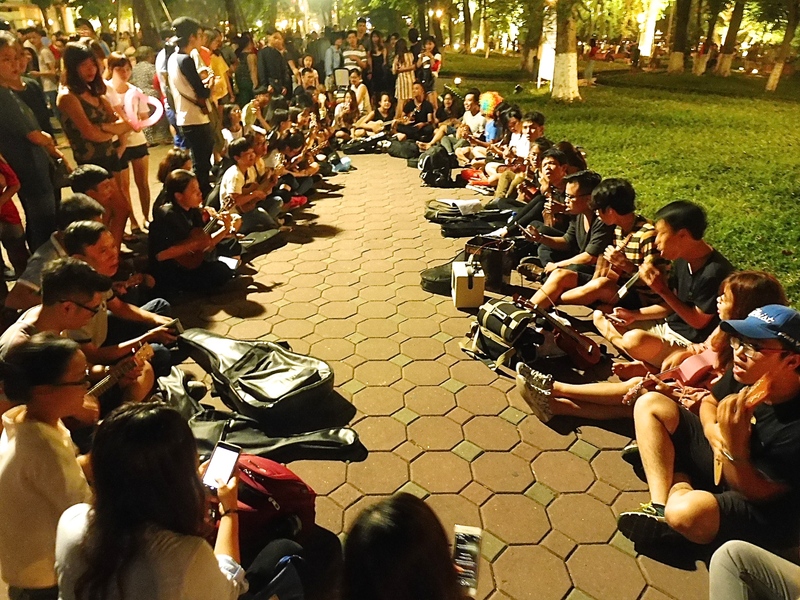 While I am fully aware there are constraints that come with living in a Communist system in which freedom of speech and assembly is limited, that certainly wasn’t visible in any of the English language newspapers in Viet Nam and Cambodia. I rather suppose one of the greatest restrictions in a Communist state, is the inability to elect to office persons the people may think best represent our interests, and in a one-party system it seems likely financial power accumulates in the hands of party favourites. It is hard not to expect the same thing is taking place in Western countries, it is just dressed up in different clothes. As for Viet Nam, the attachment to religion does not seem as strong, but still holds a presence that seems to capture the imagination as to how people are expected to conduct their lives (introspective rather than towards an external God) We did visit one interesting temple (if that is what it is called) that combines Buddhism, Taoism, Confucianism and Catholicism, a system referred to as Caodaism. The system was officially recognized in 1985 and now has about six million follows worldwide. Again, the system seems to point more toward an internal reference point rather than the external God of the one system. 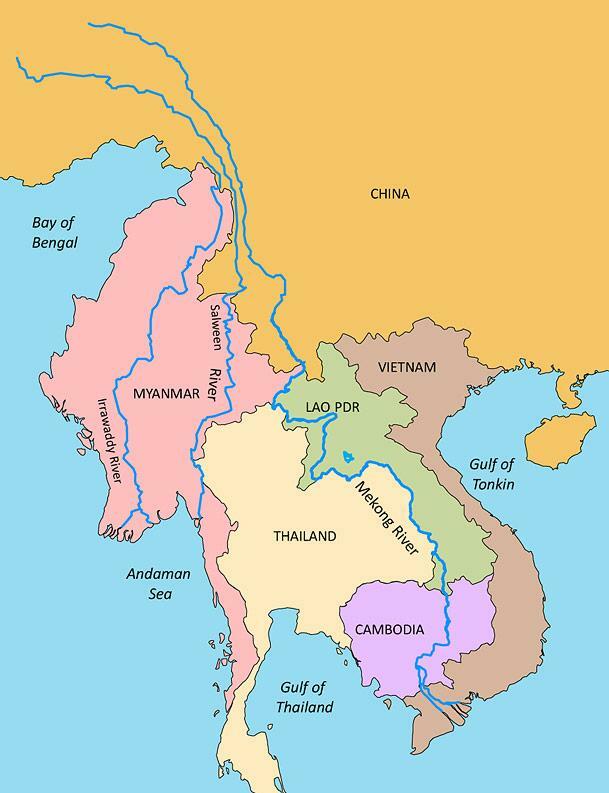 At 4300 km., the Mekong is the 11th longest river in the world stretching from the Tibetan plateau through China, Myanmar, Laos, Thailand, Cambodian and finally spreading out in the Mekong Delta area of South Viet Nam. In the floodplain area of Lake Tonie Sap in Cambodia, seasonal various in water levels cause a reverse flow in the Mekong. Even as we were flying in from the Northeast of the lake towards Siem Reap, it seemed as if the last hour and a half was over floodplain that looked as large as an ocean at 31,000 feet. Where the Mekong flows into the Delta, a backflow of salt water from the South China Sea can reach 50 km. inland and in one instance two years ago the inflow stretched 100 km. That salt flood killed thousands of acres of rice and other field crops. While did flush during the flood season, the continued building of dams in the upper reaches of the Mekong is slowly causing seasonal differences in water level that is forcing river bank farmers off their traditional land and is blocking over 80% of silt that provides nutrients, the life blood of the lower Mekong. With a basin population estimated at 60 million, farming and fishing along the Mekong provides the sustenance to the peoples of several nations along the waterway and any disruption of the flow will be catastrophic. 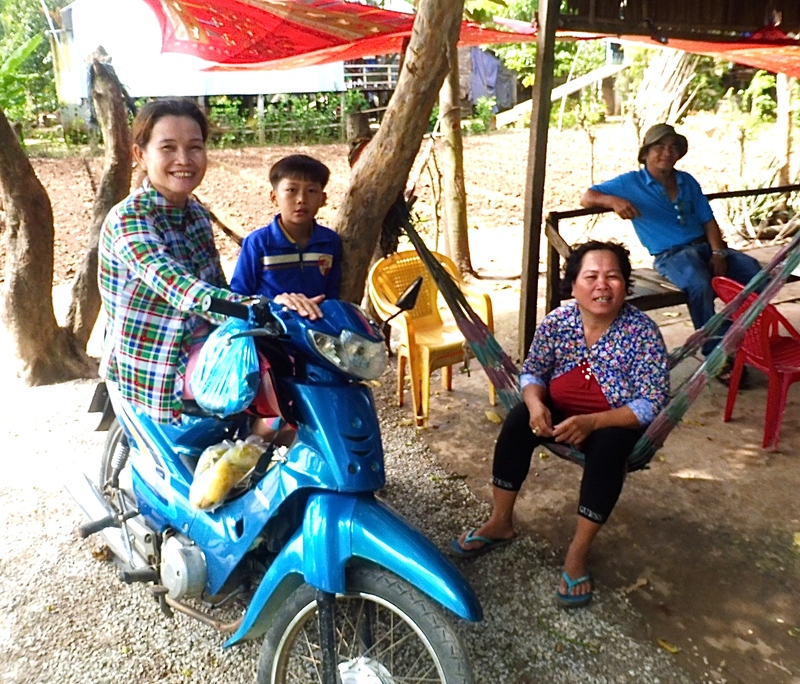 In our travels we were extremely fortunate to be able to travel up several tributaries in Sampans in order to visit small villages and fish farms that supply food to the nation. 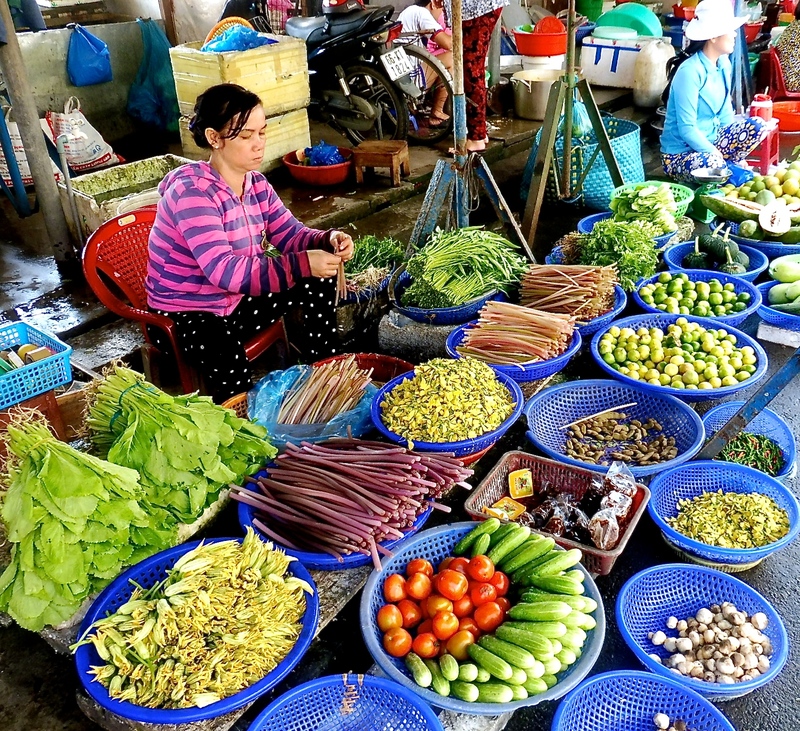 ‘Farm to Table” is given new meaning in Viet Nam and Cambodia. Whether in a small villages or a city of millions, the food being cooked for breakfast lunch and dinner is seldom older than two days new stocks arrive fresh each day. In the cities, thousands of motorcycles piled high with farm fresh fruits, vegetables, meat, poultry fish, eggs and hundreds of products begin arriving fresh by 3:00 am each morning and by at 6:00 am the stalls are opening. They close when sold out or by close 8:00 pm. While some venders deal through middlemen, most buy and sell direct as independent operators. While most major cities also have ‘hypermarkets’ the foods for sale in those locations are similar in style to the street vendors only consolidated and likely a even greater variety. We did not attend one of the hypermarkets, but sites I looked at suggest they can be very crowded. Because the entire region has a moderate that permit up to four rotational crops per year, fresh fruits and vegetables are available year round within 50 km of the city centres. Street venders generally maintain only the amount of stock that will sell out each day, but if for some reason they have a bit left over, it will be sold at a lessor price the next day. While fixed prices are not set among venders, each usually sells similar type items within the same range yet customers are free to try and negotiate a better deal. Good food that is left over from the second day is often donated directly to a charities, orphanage, monasteries and others in need. Fish and poultry is often brought brought to the city live, but may be killed and cleaned as requested of the purchaser. There seems no end of items as might be available in the fresh food section of super market in Canada including, but additional items such as rats (rice feed only), beetles and snakes are popular items in sold in street markets. If your preference is to have someone else cook your food, there are virtually hundreds of small restaurants and thousands of food carts dotting the streets. As for dry goods and other services, there are thousands of mom and pop outlets providing a thousand different services and goods. I suppose there are large outlet stores for these items, but, again, we did not go looking for that type of outlet as everything we might want could be found on the street. 8. Small Villages and Homes. 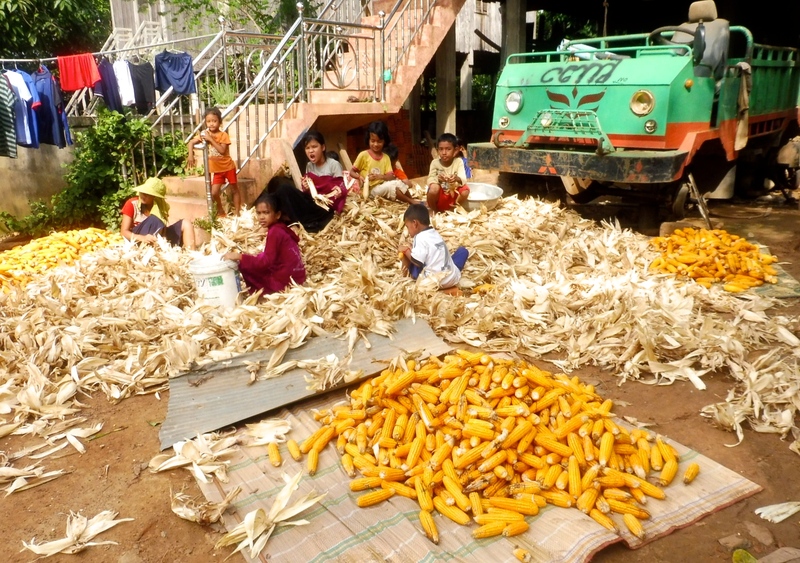 Small Village Life (hdmc): The children in this household along with a few friends shucking corn. Nothing will be wasted as ever piece of the corn stalk will be used for some purpose. Every child you see has a smile on their face and obvious love in their heart. While many westerners may consider the conditions in the small farming and fishing villages to be primitive by our standards, there is clearly a family and community cohesiveness that far exceeds that which is found back in cities and towns across Canada. Visitors are welcomed with open arms and children, as with children everywhere, are fun to be around. In those places we visited they always approached and engaged with a smile. Those who spoke English were eager to use their English words. Some may even touch your tummy as sign of respect particularly if it has a Buddha like quality. They then ask “what is your name” and “how old are you”. In return those same questions are ask of them and they respond in clear English. In each village kids were playing as adults went about the daily activities of life which may have been cleaning the house, splitting and hauling word or cleaning the animal pens. Many of the villagers likely worked at one of the more distant factories or as fishermen. While there was likely some role specific tasks, it seemed that most roles were filled with men and woman more or less equally. The homes that usually sit atop a number of pillars under which stock (chickens and cattle) were free to move. The kids were task with cleaning up any manure in the morning. The pigs seemed to be kept in separate pens. While the villages and small farm yards were often cluttered, everything was tidy in its own way. I could not help but think back to my early life on farms in Alberta and Saskatchewan. Information from our guides, particularly on our trip to Ha Long Bay (a six hour return trip) various other sources and observations made during our travels, suggests family units in Viet Nam are extremely strong with two or three generations living in the same home. It is said it takes a community to raise a child, and from we have learned so far the children of both Viet Nam and Cambodia are truly being given a head start. Even though our standard of living, educational opportunity and health care is much higher in Canada, I have a sneaking suspicion our extended family cohesiveness is being extinguished in direct proportion to our overall increase in wealth. Over the past several years of travel, it never ceases to amaze me how quickly we can have our eyes opened to some of the shortcomings of our own country when we begin to walk among the “disadvantaged” of another. I will again go back to traffic flow as an example of the high degree of peace and good will that manifests itself in Viet Nam and Cambodia. Hanoi has a population of some 7.5 million with about 4.1 million motorcycles. 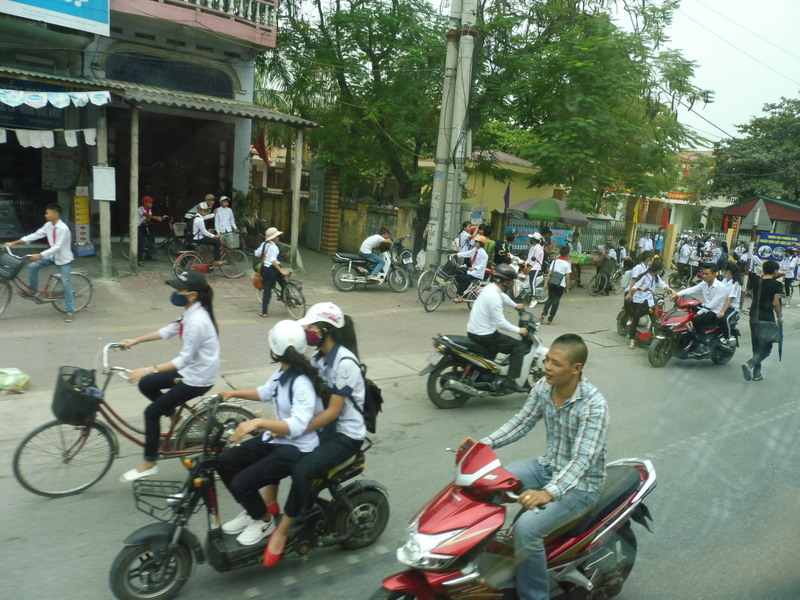 In all of Viet Nam there are 90 million people with 45 million motorcycles so it does not take long to realize the drivers of those 45 million motorcycles have a high degree of respect for others using the roadway and a full confidence that other drivers will meld into the give and take needed to keep everyone moving towards their destination. It seems certain that sense of dignity and respect did not begin the first time a child mounted their bicycle or a teen his or her motorcycle, it had to begin in the home and at school. I am not suggesting that in America we are without caring gentle people, but in everyday life there is so much pressure to succeed (by western standards) that much of the natural cohesiveness and caring that we share between and among our children is slowly bled away as we move through High School, College and then into the work place. We are trained to become competitive adults where first past the post is the winner. For those lost along the way, well that’s just too bad, they should have worked harder to get ahead. To discuss the impact the young are having in Cambodia and Viet Nam, as well as many other nations around the world, link to Part IV, below.